Problems about the municipal courts have been brought to the attention of the Ferguson Commission. Here Maryland Heights resident Dan Hyatt details his experience dealing with the one in Breckenridge Hills. Seventy-nine municipal courts give the small towns and cities of St. Louis County significant autonomy in judging minor infractions as such speeding tickets, tall weeds or zoning violations. The judges and prosecutors work part time — in smaller jurisdictions, just two or three times a month for a few hundred dollars per each municipal court session. As a result, those judges and prosecutors often work for more than one town; and a prosecutor in one place may be a judge in another. The system, as a whole, starts to become a web of overlapping hires. In its recent report, the U.S. Department of Justice concluded that Ferguson used its municipal court abusively. It wrote the court handled cases “not with the primary goal of administering justice or protecting the rights of the accused, but of maximizing revenue. 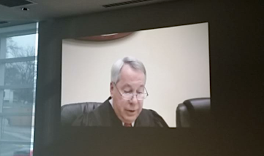 The impact that revenue concerns have on court operations undermines the court’s role as a fair and impartial judicial body.” Soon afterward, Ronald Brockmeyer resigned as the Ferguson municipal judge, and stepped down as prosecutor or judge in Breckenridge Hills, Dellwood, Florissant and Vinita Park. A review of municipal court data compiled by St. Louis Public Radio shows that one person holding various roles throughout St. Louis County is not unusual. While 72 attorneys hold just one position, 13 individuals have positions in three or more municipalities. Twenty hold two. Among them, nine attorneys work as a judge in one municipality and a prosecutor in another. Another overlap occurs among the firms where the attorneys work. Three St. Louis-area firms provide prosecutors or judges for more than a quarter of the county’s municipal courts, from Bel-Nor to Valley Park. One firm appears to specialize in judging: Three attorneys from Bruntrager & Billings, P.C. preside over courts in five municipalities: Des Peres, Fenton, Lakeshire, Overland and Winchester. The largest of the three firms, Curtis, Heinz, Garrett & O’Keefe, employs a group of lawyers who work as prosecutors in a dozen municipal courts, including Ferguson. One attorney also serves as a judge in Ladue. “There’s a team, so there’s always someone available to handle things,” Lumley said. Often, the setup allows for younger attorneys to work under the supervision of their peers. “As folks interview for the jobs, that experience and credibility goes a long way. I think they are careful to recuse themselves (step away from a case if there’s a perceived conflict of interest) when they should,” Lumley said. Combined, the courts at which Curtis, Heinz, Garrett & O’Keefe serve as prosecutors assessed $12.1 million in fines and fees from residents in 2013, according to records compiled by Better Together STL. Among those 12 courts, the percentage of the city’s general revenue coming from fines and fees varied dramatically, from 3.4 percent in tiny Lakeshire (population 1,432) to 41 percent in Normandy (population 4,987), where more than a third of the residents live in poverty. “Cities don’t live on property taxes. Sales taxes fund cities: operations, police departments and so forth. So for cities that have shopping centers and a lot of retail, their percentage of income from the court they operate is very small because they have this other income. But when you don’t have the sales taxes, the income percentage rises dramatically from the court,” Vatterott said. On whether this causes an atmosphere where court officials might be pressured to assess more fines, as the DOJ report demonstrated in Ferguson, Vatterott said there’s no doubt. “It’s not right, but I think anybody that says that doesn’t happen is a liar. There is pressure,” Vatterott said. But, he added, police officers may also feel pressure to write more tickets to increase revenues, which fund their departments. A 2014 white paper by the Arch City Defenders said the current municipal court system creates a situation where a defendant might appear before a municipal judge one day, and then face the same person working as a prosecutor in another municipality. 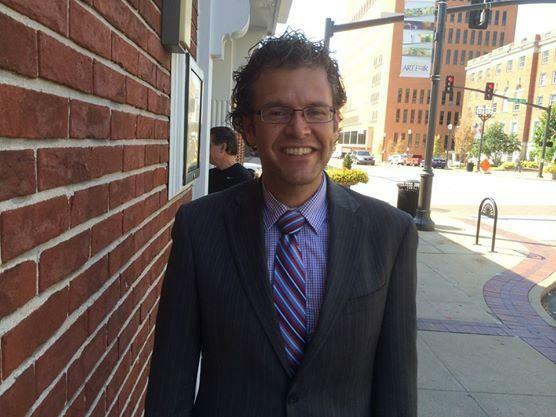 Michael-John Voss, managing attorney for Arch City Defenders, at the firm's office in St. Louis. Judges must recuse themselves from a case if there is a conflict of interest, according to the Missouri Judicial Code. If a question is raised about a judge’s impartiality, complaints would go to a state commission. But that commission receives fewer than 300 complaints annually for all courts in the state of Missouri, as St. Louis Public Radio previously reported. Donnell Smith, a private attorney whose firm specializes in criminal defense and civil lawsuits, serves as a judge in two municipalities and a prosecutor in two more. He rejects the idea that serving multiple roles causes a conflict of interest and says he works in the municipal court system because he enjoys interacting with residents. “I think it’s good that any court is being reviewed, because every system can use improvement. I just want the improvement or focus to be directed to an actual wrong or something that’s unfair that’s being done,” Smith said. As a judge in Dellwood, which borders Ferguson, Smith said he frequently allows defendants who cannot pay their fines to perform community service. “We do not lock people up because they do not have an ability to pay,” Smith said. A bill introduced by Missouri Rep. Courtney Curtis, D-Berkeley, would prohibit individuals from serving simultaneously as municipal prosecutor, municipal judge, prosecuting attorney, circuit attorney, city attorney or criminal defense attorney. As of March 20, the bill had not been scheduled for a hearing. The data in this graphic was compiled by St. Louis Public Radio through a series of telephone calls to municipal court administrators and law firms the week of March 16, 2015. The data does not include city attorneys. Due to the frequent fluctuation of this information, please send an email to dbouscaren@stlpublicradio.org if you believe any errors have been made. The appeals court judge now hearing municipal cases in Ferguson has limited the amount of fines and fees the city can collect from defendants facing traffic, animal control or housing ordinance violations. One of the most important changes to emerge from Michael Brown’s shooting is progress toward reform of St. Louis County’s balkanized municipal court system, where traffic tickets can derail poor people’s lives. Change is certain. The extent of the reform is not. Comments last week by two of the most important figures in the reform efforts illustrate starkly different views of how seriously the muny court system is broken and how thoroughly it needs to be reformed. Update 03/13/15 at 10:30 a.m.
Ron Brockmeyer has resigned as city prosecutor in Florissant and Vinita Park. He had earlier resigned from the municipal judge post in Ferguson and as prosecutor in Dellwood. Florissant Mayor Thomas Schneider praised Brockmeyer's "efficient service," saying in a statement that "his unselfish resignation will enable our elected municipal judge, Dan Boyle, to continue the work he began after his election in April 2011 to streamline and improve Florissant’s judicial process to make it even more fair, effective and efficient."